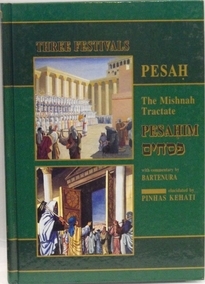 The full Mishnah text of Pesachim accompanied by the Bartenura's commentary and Kehati's elucidation. Containing numerous explanatory diagrams, pictures, photographs and maps, this volume imbues the reader with the elevating atmosphere of Pesah in Temple times. Hardcover 175 pp.